The two station printer version of the SPS-320 the SAM4s SPS-340 is a very capable machine due to its large keyboard and range of connectivity options. If your business is always changing or you like the ability of your equipment to grow with your business a smart register may be a very good choice. The SPS-340 has as standard 100 item keys on the keyboard for all those products that don’t have barcodes, or for a takeaway or restaurant to easy break down the different products they offer. The SPS-340 can handle table tracking, discounting, dine-in/take-out and other features that hospitality clients are looking for. 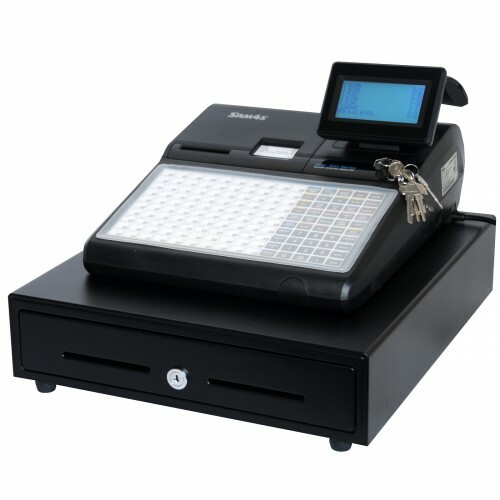 The machine is able to be ‘in-lined’ with other SPS-340 cash registers, making programming a series of machines easy. For retail you will find a large memory capacity built to handle a comprehensive product file. The SPS-340 has a lot to offer at a price other manufacturers would find hard to match.